Free App2SD Apps for Android . When you install any android app on your smartphone then it gets installed in your internal memory by default. It may not be a problem for users having android smartphone with large internal storage but not all Android Smartphones come with large amount of internal memory. Internal memory plays an important part in smooth and proper functioning of your android device whether smartphone or tablet. This is because the Android OS and all other important system applications & apps require some internal memory for their working. If you ever run out of internal memory in your phone then you will experience various problems mentioned below. Here are the various symptoms and problems that you can face if your phone has low internal memory. Slow Performance – Your android smartphone will be very sluggish if you have very low internal memory or your internal memory runs out of space. Apps Crashing – Some of Applications may crash in the middle of your work with or without warning. This can be very frustrating if you are in the middle of any important work. Frequent Freezing – Your android device may freeze or hang frequently and you will have to restart it to make it work again. Apps Failure – Some of apps may fail to load or start and you cannot do anything about it other than to free some of internal memory of your android device. The best solution to low internal memory problem is to move your installed apps to the SD Card or memory card of your smartphone. You can do this by using App2SD Apps which can make this process much faster and simpler. 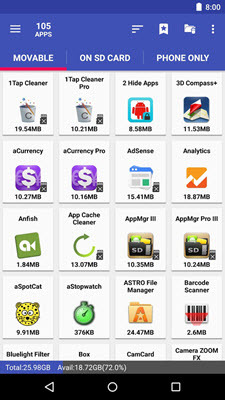 Here in this post I am going to provide the list of best app2sd apps to move your apps installed on the internal memory to the microSD card or memory card of your android phone or tablet. Here are the top app2sd apps to move your apps from the internal memory of your smartphone to your SD memory card. AppMgr III is one of the best App2SD android apps for moving apps from internal memory to your SD card. It is also known as App 2 SD and it supports most of the android smartphones and tablets. Upon installing it scans your android device for all the apps present on your phone memory, SD card and movable to SD card. It also shows you the total and available SD card and Phone memory. The sort functionality lets you to sort apps on the basis of total size, data size, cache size, application size, application name and last update time. On the Movable tab you can move the apps from phone memory to the SD card and on the SD card tab you can move the apps from SD card to phone’s internal memory. The Phone only tab shows the apps that cannot be moved and will stay only in the internal memory unless you Root your android phone. This app2sd app also lets you clear cache so that you can get more free space on your phone memory or SD card. There is a search feature to search the apps if your apps listing is very long. You can also move all apps at once and hide apps you like. The Freeze apps feature lets you freeze apps so that won’t use your CPU, memory or other resources. From its interface you can also uninstall apps in batch or share apps with your friends. This App2SD app does not require ROOT. Highly Recommended App by me. Note: This App2SD App may not work on HUAWEI, LG, XIAOMI, ASUS with Android 6+ because the manufacturers in these devices have removed the app2sd function. This is another very good and feature rich App2SD app but it requires ROOT access to your phone. The other requirement of this app is that it requires 2 partitions on your SD card. You can also use the inbuilt partition tool to create partition on the SD card. Using App2SD you can move apps to SD card or to phone, freeze apps, uninstall apps, link/unlink apps, hibernate apps, hide apps, backup and restore apps. 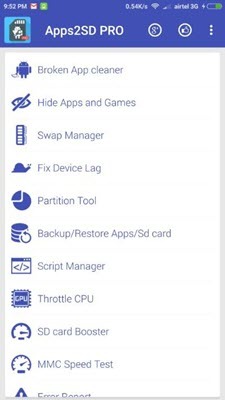 It also has other nifty features such as brokem app cleaner, partition tool, App manager, Task manager, SD Card Booster, SD Card Speed Test, SDFix and more. The only downside of this App2SD app is that it requires ROOT access which means you have to ROOT your Android Smartphone before using this app. You can buy its pro version which is App2SD Pro to get rid of all the annoying ads. SD Card Booster and more. Shadow fight 3 – next game in a series of meg popular fighting games by Nekki. As before you fight in spectacular battles to defeat your opponent. Choose a character, each with own combat style, advantages and disadvantages. You can fight real time battles or do missions and receive bonuses. New thing is that you can switch into shadow fight mode that gives your new abilities. – Loot chests: fight in duels to advance in dans and win more powerful item chests! – Item upgrades: stack your items to get Shadow Energy and spend it on upgrades! – Free item cards: return every 4 hours to get some equipment! “com.nekki.shadowfight3” folder “android / obb” copy into.